The autistic world is both fascinating and frustrating. From the outside looking in, we know many autistics love repetition and the security of sameness, but often cannot tell us why. Yet in those rare instances when an autistic child or adult can explain the world as they see it, artists, educators, family members, and other “outsiders” rejoice because they can finally learn about autism on a deeper level. Author Jill Mullin offers a way to examine at least a portion of autistic thoughts and ideas. Her book Drawing Autism uses the premise of art as a universal language to open a doorway that allows us to “see” inside the world of autism. Drawing Autism first explains Autism spectrum disorder (ASD) as a developmental disability “associated with social interaction, communication impairments and rigid and/or repetitive behaviors.” Then it groups a stunning collection of drawings by autistic children and adults across the globe according to these categories. In the section called social interaction, professionals and laypersons alike see drawings representing over-crowdedness, aloneness and everything that falls in-between. There are lone figures surrounded by words, floating bodies surrounded by knives, and ghostly figures of people who are actually marionettes controlled by string. There are sometimes no words to explain the premise of these illustrations, because often the illustrator is nonverbal. In these cases, a parent, guardian, or art instructor chimes in with what they perceive to be the reasoning behind the drawings. To the educator and the layperson, this artist’s busy illustration and simple explanation are both quite fascinating because they offer a singular glance into a hypersensitive, overcrowded brain that is attempting to make sense of the world as the autistic artist sees it. In the section that represents communication (or lack thereof), one striking picture shows a lone werewolf standing on a hilltop, face raised to heaven, howling at the moon. This artist explains that he drew this picture during a time of grief, when he had no words to express his despair after his niece and nephew died in a fire. In the rigid and/or repetitive behaviors section, one child’s illustration reminds the reader of “art time in the elementary classroom.” He has drawn and colored a serene picture of his house, something he has done “a thousand times or more,” according to his mother. The house is surrounded by a garden and two trees, and topped off by two fluffy clouds. The artist does not have a broad vocabulary, but he is able to express himself in a simple and repetitive way, stating that he draws the same picture over and over because he likes his house. “My house never changes,” he says, then explains that “neither does he.” He goes on to say that he draws to show people he is happy with his house and himself. 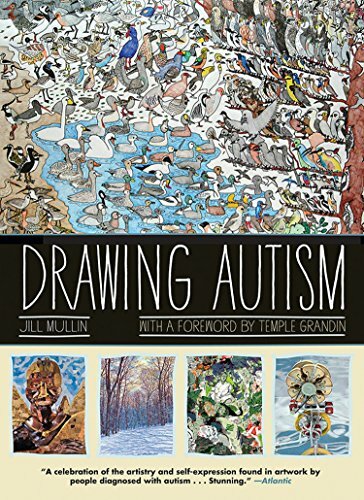 Drawing Autism is a unique collection of what may actually be priceless art, because the illustrations do more than entertain the eye; they actually provide a gateway into the autistic mind. This book is like a key to opening doors across educational and medical landscapes. But perhaps even more importantly, the fact that many of the artists are able to explain what they were feeling at the time of their drawings will surely help this book find solid footing among parents, caregivers, and extended family members who have, up to this point, struggled to understand the inner workings of their precious loved one’s autistic mind.